Readers of the new Resilience Success Guide know that increasing confidence in the future of a place is the single most important objective of any revitalization initiative. When the overall opinion is that the city or neighborhood has turned an economic corner and is on the way up, residents and employers don’t move out, and new residents and employers move in. How to create that confidence? Reconnecting the place is a good method. In cities all around the world, merely promising a major new transit or rail initiative is enough to trigger redevelopment: the first shovelful of dirt doesn’t even have to been dug yet. In Kansas City, Washington, DC, and many other cities, announcing future streetcars immediately triggered redevelopment along their routes. Why? Because the announcement created new confidence in the future of the properties and neighborhoods along the streetcar routes. 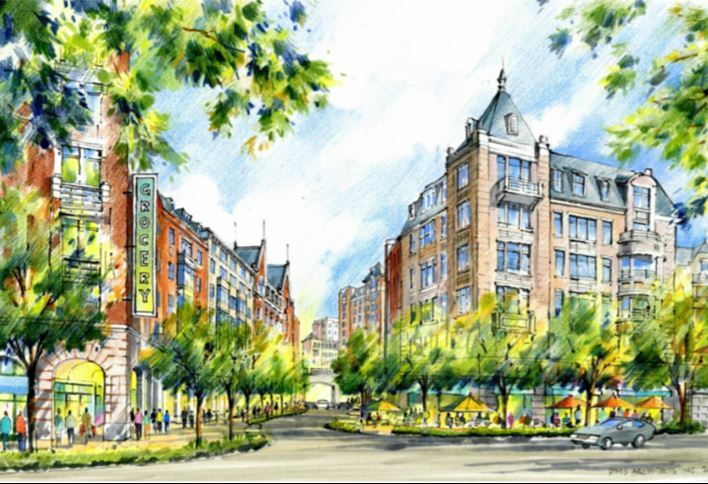 3 buildings with 530 residences coming to downtown Chevy Chase, MD. Image: Bozzuto. But this dynamic only occurs when government is credible. If it suffers from partisanship—each party blocking all initiatives of the other, regardless of merit and heedless of damage to public good—few will have confidence in its announced policies, programs, or projects. In that case, revitalization won’t precede the project. In fact, it will probably lag the project, with investors and redevelopers not trusting in its completion. That’s the cost of lack of confidence. 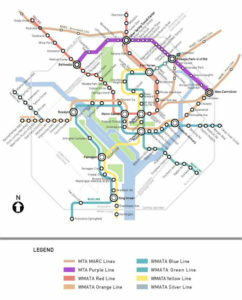 Speaking of Washington, DC, a new Purple Line is being added to the area’s Metro system. The DC-area Metro is the third-busiest rapid transit system in the United States in number of passenger trips, trailing only that of New York City Subway and Chicago. Best-known these days for shut-downs, accidents, and delays, being traditionally one of the worst-managed on the planet. That said, the present General manager Paul Wiedefeld, hired in November of 2015, has done an excellent job of managing the system during its recent safety-oriented emergency renovation. It was an emergency due to decades of deferred maintenance. That, in turn, was due in large part the poor design of the Washington Metropolitan Area Transit Authority (WMATA) back in the mid-70s: its funding model was never very viable. 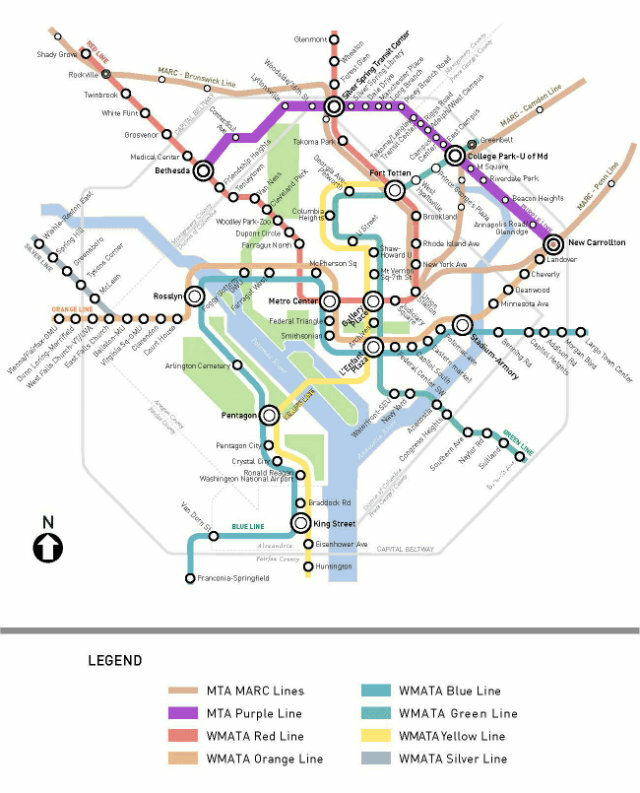 But back to the Purple Line: Running east-west along the northern edge of the Beltway in Maryland, this new, 16-mile, 21-stop light rail line will connecting Bethesda to New Carrollton. Construction won’t begin until late 2017, with service beginning in 2022. But redevelopment–some of it huge–is already happening along the rail line. Elizabeth House image courtesy of the Lee Development Group. 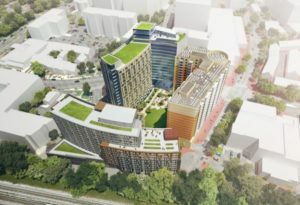 An example is the $200 million redevelopment and expansion of the 50-year-old Elizabeth House senior living facility in Silver Spring, by a partnership of the Lee Development Group and the Montgomery County Housing Opportunities Commission. It will be built in three phases. After the first, 15-story, 277-unit Elizabeth House III is built, the seniors in the original Elizabeth House will be moved to the new building and their old home will be replaced by the 19-story, 330-unit Elizabeth House IV. The neighboring 24-year-old Alexander House will also be renovated as part of the project. The new facilities will boast a wellness center, artist workspace, and rooftop garden. 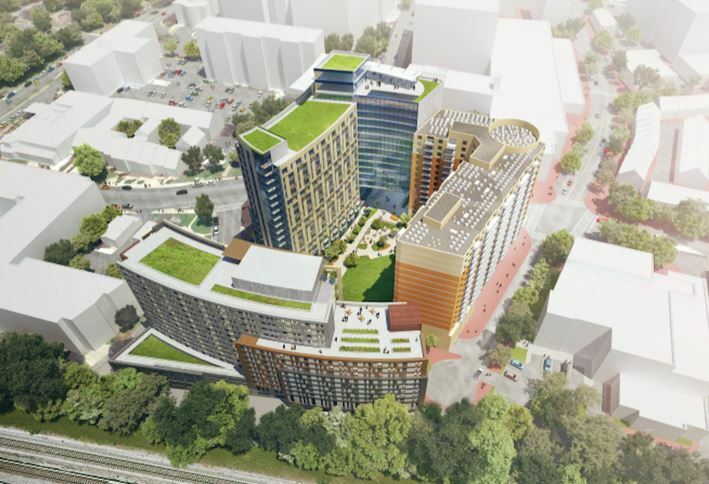 Another Silver Spring Purple Line project that’s already underway is the massive $650 million redevelopment of the 1950s-era Blairs development (pictured at top). 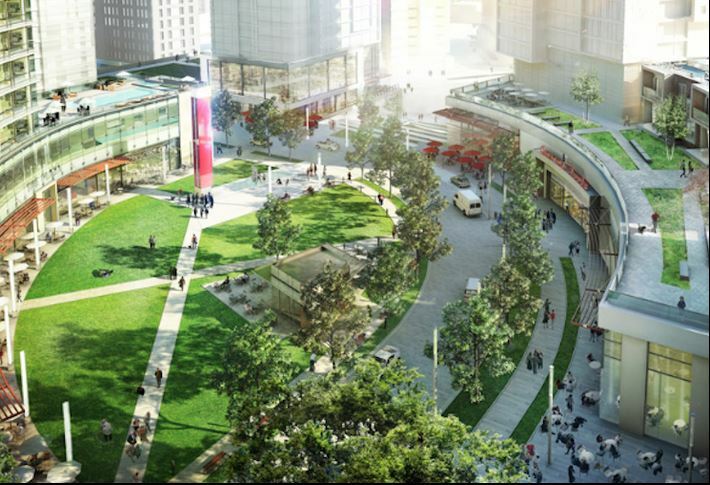 It will include a five-acre public courtyard for concerts, farmers markets, movie screenings, and other public gatherings. The article linked to below describe eight more large Purple Line redevelopment projects. As with any massive infrastructure project in an already-developed area, there’s no shortage of NIMBYism, with attendant lawsuits. Some of the lawsuits are probably well-deserved, as planners have reportedly been shockingly insensitive to the needs of those business owners and residents being displaced. But there’s little question that this addition to the DC-area Metro system is necessary. Featured image of Blairs courtesy of The Tower Companies. See June 22, 2017 BisNow article by Jon Banister about the 10 largest Purple Line redevelopment projects. 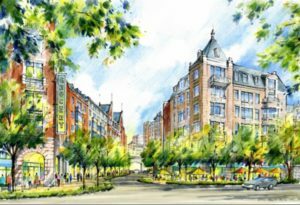 See July 20, 2017 DCist article by Rachel Sadon.